Devices of the series 39 achieve a very high energy efficiency, since the integrated program only adds as much air as is required for dehumidification of the pool hall air. The overall efficiency of the system is further enhanced by the integrated heat pump. 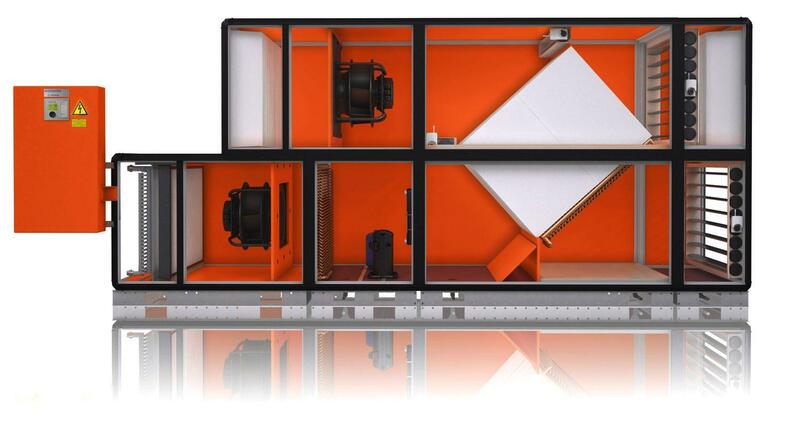 Due to the structural design of the unit the cleanability according to VDI 6022 is ensured. If no requirements are specified regarding temperature regulation or dehumidification when the swimming pool hall is in standby mode, the system operates only in recirculation mode. The air circulation in the swimming pool hall is guaranteed, with the fans working at a lower capacity. The pumped hot water heating coil heats the swimming pool hall as required in recirculation mode. In order to reduce the internal pressure losses, the recirculation air defrost damper is also opened. The outside air and exhaust air dampers are closed. Return air is cooled and dehumidified in the evaporator of the continuously adjustable heat pump, reinforced by the upstream heat exchanger. The outside air, with its low moisture content, is preheated in the heat exchanger, and is subsequently mixed with a proportion of untreated recirculated air, heated in the condenser using the heat energy from the dehumidification process, and fed into the swimming pool hall as supply air. If the heating capacity is not sufficient, the supply air is reheated with the heating coil. 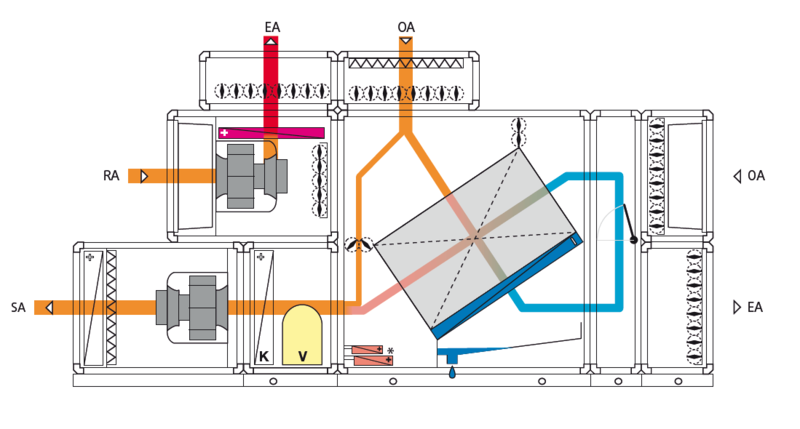 The use of the freely controllable heat pump allows the demand-oriented regulation of the volume flow rate. This guarantees a consistent humidity level in the swimming pool hall while consuming minimal energy. For hygiene reasons, a minimum of outside air is fed into the swimming pool hall during swimming pool mode. The proportion of outside air is determined based on the current evaporation of water (and therefore the occupancy level of the swimming pool hall) and is continuously adjusted. In the case of rising outside air humidity, the recirculation air damper is continuously closing as required. If the outside air moisture is high, the damper closes completely, the system works exclusively in outside air-exhaust air mode via the heat exchanger. The demand-oriented flow rate control reduces energy consumption to a minimum. In order to achieve the hall humidity levels required by VDI 2089 in summertime conditions, it may be necessary and more economical to use an additional damper system. A second outside air duct is used to take in outside air. Some of the outside air is precooled via the recuperator, and then cooled below dew point in the evaporator. The air is then reheated in the recuperator, and then dried and cooled with some of the untreated outside air, before being introduced into the hall as supply air. If no heating of the swimming pool hall is required, the heat of condensation is discharged directly into the return air flow.